Technology has made great strides in communication, but in this fast-paced world, digital interconnectedness sometimes comes at a cost. On one hand, we all know how difficult it is to keep our personal and professional lives separate, and we’re often expected to answer work phone calls even on the weekends. On the other hand, technology has also made it possible to take care of work responsibilities while still being present in our personal and family lives. For example, today you can host a business conference call from your home office and then immediately spend time with your children without ever having to commute back and forth from the office. While life can get hectic, there are many products that can bolster your productivity by seamlessly keeping you in touch with colleagues and family no matter where you are. VoIP phone service is one of the most popular, effective, affordable and flexible tools that can help keep you on the same page with all of your most important contacts. VoIP stands for voice over internet protocol (also referred to as voice over IP, IP telephony or Internet telephony). To put it simply, VoIP is an internet-based telephone service. Instead of having your audio transmitted through landlines or cell towers, VoIP technology works behind the scenes to deliver phone call audio via the internet. Using a VoIP telephone system is very similar to using a landline or a cell phone. 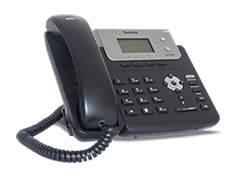 When you’re using VoIP technology, your home or office phone will look and function just like a landline. You can also use a VoIP app on your cell phone so the calls are routed over a Wi-Fi or data connection, saving you from using minutes on your mobile phone plan. Like traditional phone services, VoIP technology includes a variety of features, ranging from voicemail to fax, caller ID and call waiting. Additionally, VoIP technology offers more than just phone service. Many VoIP services also come equipped with instant messaging, web and video conferencing, and the ability to transfer calls from desk phones to smartphones. When selecting a VoIP service, you typically have three choices: computer to computer, ATA, or IP phone. It’s best to first assess your needs and compare each choice, because they all have their advantages and disadvantages. It ultimately comes down to your budget and the features that best suit your specific needs. Now that we’ve got the basics about VoIP technology out of the way, you probably want to look at the available phone services to see if a VoIP plan can work for you. To help make your decision easier, let’s look at two of the leaders in the VoIP industry — Ooma and RingCentral. Both Ooma Office and RingCentral are on the cutting edge of business phone service, providing scalable plans for companies of any size. Both Ooma and RingCentral also accommodate the needs of today’s on-the-go workforce and mobile lifestyle. While the two services do have some similarities, there are differences in pricing, features, contract terms, reliability, and customer service. Let’s look at the aspects of each phone service so you can decide which one is best for your business. Regardless of how you want to use your VoIP phone service, pricing likely plays a large role in your decision making. Both Ooma and RingCentral are popular choices for enterprise-level VoIP phone service, but come with different costs. With RingCentral, the cost per user changes based on the number of users you have, the types of features you want, and how frequently you want to pay. For example, pricing as of March 2018 for a team of five with monthly payments would cost between $1,799.40 and $3,599.40, depending on which plan you select. With Ooma Office phone systems, plans are straightforward and affordable, starting at $239.40 per user each year, which equates to $1,197 for a team of five. So in this scenario, your annual savings per user would be between $120.48 and $480.48. The biggest up-front cost with Ooma is the one-time hardware purchase of the Ooma Office base station, which retails for $199.99 with the current $50 discount promotion. This device works with your existing analog phones and also connects to IP handsets. Comparatively, RingCentral has options for renting equipment, which eliminates any initial hardware purchase. While the upfront cost of purchasing the Ooma hardware may be a deterrent for some, many businesses find that they actually pay less in the long run due to the lower monthly rate. Additionally, the international dialing rates for both Ooma and RingCentral are significantly cheaper than the rates available through traditional phone service providers. So international callers will have even bigger savings. After reviewing the pricing differences, you also want to go over the features that are provided by Ooma and RingCentral. With Ooma, the basics, such as voicemail, extension dialing, caller ID and its reliable 911 services, are free. You’ll have unlimited calling within the U.S. and Canada, ring groups, music on hold, conference bridge, virtual fax and more. Ooma even offers digital call logs, multi-ring and modes for after hours. Ooma also has a mobile app for Apple and Android users so you can receive calls and messages on your cell phone as though you were in the office. This presents a professional and seamless communications structure with no explanations for callers to use your personal line. Additionally, Ooma offers an advanced voice compression algorithm that reduces bandwidth consumption by 60% over standard VoIP technology. No wonder Ooma Office has been rated #1 by PCMag for the past 5 years. Historically, the focus of RingCentral’s VoIP service has been on larger businesses and the global workforce. And while Ooma Office was previously limited to 20 users per system, a recent upgrade has enabled it to now accommodate a range of users, from the self-employed to companies with hundreds of employees. This expansion makes Ooma a strong VoIP solution for businesses of any size that may be thinking of scaling their operations. Like Ooma Office, RingCentral offers business features like a virtual receptionist, call logs, conferencing and a toll-free number. But RingCentral also offers integrations with business software Microsoft Office 365, Oracle, Salesforce and Zendesk. For businesses with enterprise-level software, phone service integrations can be a useful timesaver. RingCentral’s VoIP service has previously earned the brand third place in PCMag’s 2016 VoIP Business Choice survey, and 9th place in the 2017 VoIP Business Choice survey. And in 2018, RingCentral ranked in sixth place. 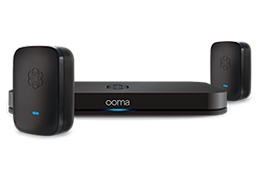 Comparatively, Ooma reviewers have been nothing but impressed with its quality, cost, and customer service. In fact, Ooma has been the #1 pick in PCMag Business Choice survey for all five years that the survey was conducted. When comparing the support provided by both Ooma and RingCentral, PCMag reported that 26% of RingCentral customers needed tech support, compared to just 7% of Ooma users. Ooma Office offers 24/7 chat support, and phone support is available weekdays 8 a.m. to 8 p.m. EST and weekends from 11 a.m. to 8 p.m. Additionally, customers who have reviewed Ooma have found the customer service to be helpful and typically efficient at resolving any issues quickly and painlessly. And if there are any service disruptions, Ooma always keeps customers informed. While both Ooma and RingCentral provide low-cost VoIP phone service that saves customers thousands of dollars when compared to traditional telephone services, Ooma has consistently been rated as the top VoIP service for businesses, as compared to the less positive reviews of RingCentral’s service. In fact, 89% of survey respondents would recommend Ooma Office to a colleague. In short, Ooma provides high-quality service that is consistent, reliable and flexible.